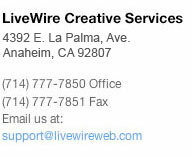 If “patient experience” is important to you, then LiveWire is a valuable resource. We’ll help you create a space that promotes a sense of health and wellbeing. in medical facilities… no odors, no VOCs.